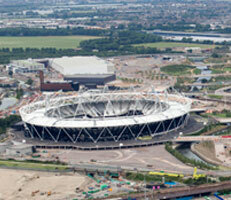 The Olympic Delivery Authority remains on course to deliver its work on the Olympic Park successfully. But almost all of the Public Sector Funding Package is likely to be required, with little scope for unforeseen costs to emerge in the eight months left. "The programme to deliver the venues and infrastructure for the 2012 Games remains on course, so it looks as if value for money will be achieved in this area. "However, not everything is rosy. The Government is confident that there is money available to meet known risks, but, in my view, the likelihood that the Games can still be funded within the existing £9.3 billion public sector funding package is so finely balanced that there is a real risk more money will be needed. Moreover, important issues relating to the cost and staffing of venue security and restrictions on transport in London are still unresolved. The experience of spectators, visitors and Londoners in general would be diminished and the reputation of the Games put at risk if these issues were not sorted out." The Olympic Delivery Authority remains on course to deliver its work on the Olympic Park on time, within budget and to the standard required. On current projections, however, almost the whole of the £9.298 billion Public Sector Funding Package for the 2012 Games is likely to be required, with little scope for further unforeseen costs to emerge in the eight months left. According to today’s NAO report, the construction project was 91.9 per cent complete at the end of September 2011, against a target of 92.5 per cent. Fourteen of the 26 construction projects have been completed and handed over and the remaining projects are on course. The Olympic Delivery Authority has also either completed, or is on course to complete, its transport infrastructure projects, such as increasing capacity on the Docklands Light Railway. Overall, for operational planning, good progress is being made across almost all of the principal areas of work. However, detailed work by the delivery bodies has identified significant challenges, particularly in the cost of venue security and some elements of transport planning. The likely cost of venue security for the taxpayer has nearly doubled in the last year: the latest estimate is £553 million, an increase of £271 million. The London Organising Committee, LOCOG, had estimated that it would need 10,000 security guards. The current estimate is for as many as 23,700, requiring LOCOG to renegotiate its contractual requirements and producing a significant recruitment challenge. In transport planning, there have been delays to the full integration of some elements of the transport programme. Until this is completed, it will not be possible to inform local authorities, businesses and individuals of the full impact of the Games on transport in London. The prospect of legacy benefits was a key element of London’s bid. The Legacy Company is on track to select a developer for the first phase of housing on the Olympic Park but has experienced setbacks in securing users for the Media Centre and the Main Stadium. It will be years before the value for money of legacy projects can be fully assessed.